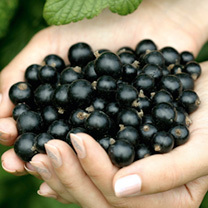 Unlike most blackcurrants, which are primarily raised for juice production, Ebony has been specially selected for garden planting. Take one look and it's easy to see why: the size of the fruit is amazing - up to twice the size of other blackcurrants. But it's the taste that really sets Ebony apart as the fruit is exceptionally sweet with technical measurements suggesting it's the sweetest ever! Superb in fruit salads and sweet summer puddings. Supplied as a healthy two year old plant. Up to twice the size of normal currants! Plant 1.5m (5') apart with 1.8m (6') between rows. They prefer an open, sunny position, but will tolerate partial shade. Soil should be free draining. Dig over the ground in autumn and incorporate plenty of well rotted manure or compost. Recommended for deep freezing and are perfect for pies and jams or for garnishing and decorating desserts! HEALTH BENEFITS - A good source of vitamin C (Anti-ageing, wound healing, decreasing blood cholesterol and prevention of infections. Assists the body in absorbing iron).